Last year we were involved in distributing the Academic Reading Format International Survey (ARFIS) in the UK, which was completed by students around the UK. The final report was published in LSE Research Online. While it’s not directly related to copyright, the study is of interest given how much work and money has been invested in preparing readings in digital format for students. The findings across the world show that students in general still prefer print to electronic for academic reading. Diane Mizrachi, from UCLA, the founder of the survey has sent a short update on the work she, and other members of the international team have been undertaking and is planning a panel discussion at ECIL in St Malo, France in September. The ARFIS team now includes researchers from 36 different countries on six continents. Two country studies (South Africa and Hong Kong) are still underway. Several of the team met informally at the European Conference on Information Literacy (ECIL) last October and outlined ideas for disseminating our research to larger and more diverse audiences. In March 2017, several authors submitted a report to Science but they deemed it out of their journal scope and recommended publishing in a more specialized journal. They have expanded and reworked the manuscript to include comparative analysis from 21 countries and citations from ARFIS country studies published by our team members. Last week it was submitted to journal, The Internet in Higher Education, whose readership focuses on educators and educational researchers, and we are awaiting their decision. 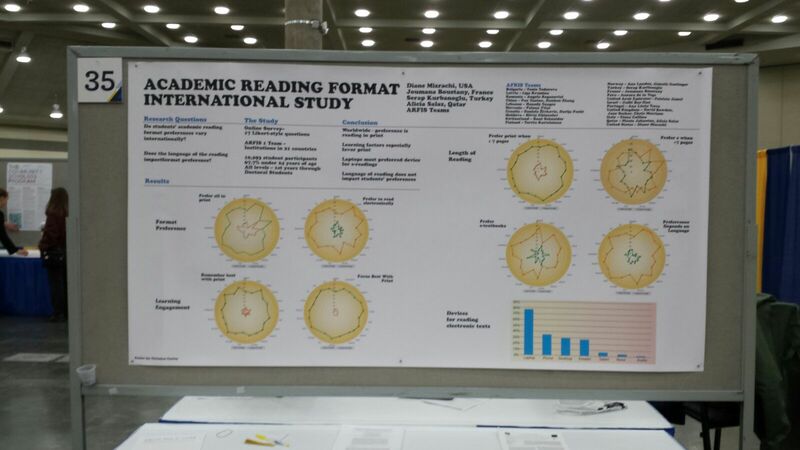 In March Diane presented a poster on our work at the Association of College and Research Libraries (ACRL) conference in Baltimore, Maryland, USA (pictured). Librarians were very appreciative and encouraging. They kept telling her ‘We KNOW this! The students keep telling us this! Thank you for documenting their attitudes and please continue.” Last month she was the guest of Carnegie Mellon University in Qatar where she spoke to about 80 librarians, educators, and administrators about the study. There were many questions, a lively discussion followed, and an English language news publication picked up on it. And just last week Diane spoke with a senior scientist at Google about ARFIS. He had heard about it from a mutual acquaintance and wanted to know more. She shared with him the survey instrument and some of the findings.